The Third Treaty of San Ildefonso was a treaty between France and Spain in which Spain returned the colonial territory of Louisiana to France. The treaty was concluded on 1 October 1800 between Louis Alexandre Berthier representing France and Don Mariano Luis de Urquijo for Spain. The treaty was negotiated under some duress, as Spain was under pressure from Napoleon, although Spain did gain the Tuscany area. The terms of the treaty did not specify the boundaries of the territory being returned, which later became a point of contention between Spain and the United States after the Louisiana Purchase in 1803, in which France sold its territory to the United States. This treaty also affirmed the earlier Treaty of Alliance signed at San Ildefonso on 19 August 1796. The French Revolution ended in Napoleon's taking of executive and legislative power in his coup of 18 Brumaire 1799, whilst France was immersed in the War of the Second Coalition. Following the signature of the Peace of Basel, which put an end to the War of the Pyrenees between France and Spain, both countries maintained a military alliance embodied in the signing of the Second Treaty of San Ildefonso on 1796, which committed either party to go to war against a third country if attacked. It was this alliance that led to Spain's entry into the war against Great Britain, leading to the loss of Trinidad and Menorca in 1798 and the attacks on Ferrol and Cadiz in 1800. Spain's financial system was facing serious trouble; from 1780, banknotes were circulating as legal currency, as a new form of government bonds invented by Francisco Cabarrús. The British attacks on Spain's colonies and convoys returning from America, along with Britain's commercial blockade, added to an already worsening economic situation, with the national debt increasing eightfold between 1793 and 1798. Charles IV and Maria Luisa of Parma ruled Spain, with Manuel Godoy as prime minister. Italy in 1796; Tuscany, in yellow. 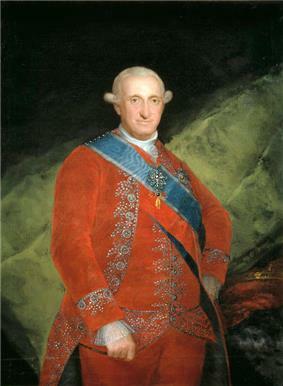 Mariano Luis de Urquijo, representing Charles IV of Spain, and Louis Alexandre Berthier, representing the French Republic, adjusted a preliminary agreement on 1 October 1800 (9 Vendémiaire, year IX, of the French republican calendar) at the Royal Palace of La Granja de San Ildefonso. The French Republic would establish a newly created territory on the Italian Peninsula on behalf of the ‘infante’ (prince) Louis Francis of Bourbon-Parma, son of Ferdinand I of Bourbon-Parma, Duke of Parma, where he would be acknowledged as ‘king’—the territory was not precisely determined but Tuscany was suggested. One month after the prince's takeover, Spain would hand over six 74-gun ships-of-the-line to France. Six months after, Spain would retrocede the colony of Louisiana to France—under Spanish possession since the Treaty of Paris (1763) that ended the Seven Years' War. The agreement would be kept under top secrecy—even Manuel Godoy, Charles IV's favourite, did not know about it until one month after its ratification by the king. This agreement was later known as Third Treaty of San Ildefonso to be distinguished from those signed in 1777 and 1796. Minister Urquijo was removed from office by the end of 1800 because of his disagreements with the Catholic clergy. The Spanish-French military alliance of 1796 was renovated by the treaties of Madrid and Aranjuez—beginnings of 1801, see below—and both countries' armies arranged their efforts against Portugal and Great Britain respectively. On 9 February 1801, France and the Holy Roman Empire signed the Treaty of Lunéville which empowered Napoleon to force Ferdinand III, Grand Duke of Tuscany to resign and leave the duchy. The duke was rewarded with the Archbishopric of Salzburg that had been secularised and transformed into the Electorate of Salzburg—of which he was appointed Prince Elector. Then, with Tuscany dominated by Napoleonic France the way to implement territorial exchanges became open. Resignation of Ferdinand I to the Duchy of Parma, for himself and his heirs. Cession by France of the Grand Duchy of Tuscany to Louis-Francis of Bourbon-Parma, Ferdinand's son. Recognition of Louis as King of Tuscany with French support. 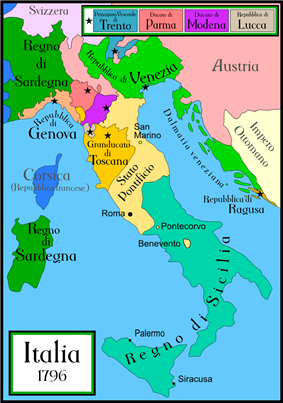 The Tuscany's part of Elba island would pass to French sovereignty; in compensation, the Principality of Piombino and the State of Presidi would be ceded by France to Louis, annexing them to the new territory. If there were not successors in Louis's family the rights to Tuscany's throne would go to the Spanish Royal House. Cession of the vast territories of Louisiana to France. Joint Franco-Spanish indemnization to Ferdinand in exchange for his resignation to the Duchy of Parma. This new agreement was signed by Charles IV on 11 April, that same year. Even though not written in the treaty, the French delegation pledged that in case France wished to leave Louisiana, it only would be given back to Spain and not to any other state. 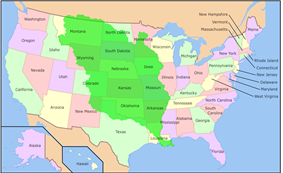 Territory of Louisiana in the early 19th century (in green), superimposed on the present-day United States. 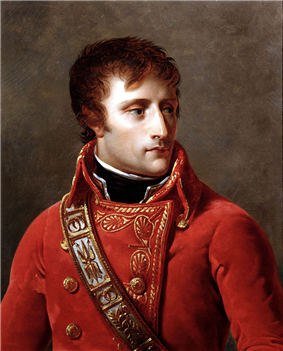 On 25 May 1801, the infante Louis Francis arrived in Paris and was received by Napoleon and Joséphine; he left Paris on 1 July for Florence, Tuscany's capital, where he assumed power as king, backed by the French army commanded by General Grouchy. The new kingdom was named Etruria, after the region's name in ancient Roman times. The Duke of Parma, Ferdinand, refused to accept the conditions of the treaty concerning his resignation of the duchy, and instead of receiving the indemnification established in the treaty of 1801, continued possessing it—with French support—until he died the following year. From that time on, the Duchy of Parma was a part of the First French Empire. On 15 October 1802, Charles IV published a royal bill in Barcelona that made effective the transfer of Louisiana, providing the withdrawal of the Spanish troops in the territory, on condition that the presence of the clergy be maintained and the inhabitants keep their properties. The colony did not remain under French sovereignty for long as France sold Louisiana to the United States the next year (1803), ignoring the promises made to Spain in the conversations about the 1801 treaty. Historians are generally of the opinion that the treaty clearly favoured France. The territory of Spanish Louisiana, then inhabited by approximately 50,000 European settlers, extended from the Gulf of Mexico—the present day state of Louisiana—up to the Canadian border, an area 100 times that of Tuscany. Moreover, Spain lost the Duchy of Parma and the six battleships pledged in 1800. The treaty was harshly criticised, then and later, by historians. (about Louisiana) ...because of our lack of means to provide it (Louisiana) with an increase at the same level as the other Spanish dominions of both Americas, not yielding much to our treasury, nor to our trade, and generating sizable expenses in money and soldiers without profit, and receiving other states in exchange for it, the return of the colony can be deemed as a gain, instead of a sacrifice.(...) Almost all is yet to be done, just a sprout of life on those unpopulated regions. In Tuscany all is done, cultivation perfect, industry flourishing, trade expanded, benign ways, civilization at high level, country rich in monuments and prodigies of art, in precious antiques, in magnificent libraries and renowned academies; a million and a half inhabitants; state revenues of about three million pesos fuertes, no debts; an extent of six thousand five hundred square miles. ^ Tratado de San Ildefonso de 1800, (whole text in Spanish). ^ a b Manuel Godoy: Memorias del príncipe de la paz, pag. 14-63, (1836) (in Spanish). ^ Tratado de Aranjuez de 18 de marzo de 1801, (whole text in Spanish). ^ Modesto Lafuente: Historia general de España, pag. 425, (1862), in Spanish. ^ Manuel de Mendiburu in Diccionario histórico-biográfico del Perú, page 205: "...daba el Rey una importante provincia, varios de sus navíos y entraba en una guerra onerosa en cambio de un pequeño territorio de Italia". ^ El censor: Periódico político y literario, page 380: "Dícese que de resultas de un tratado ventajoso que hizo nuestro ministerio allá en San Ildefonso el año de 1800, tuvimos la gran fortuna de cambiar la provincia de la Luisiana nada menos que por el reyno de Etruria, sin otra adeala que dar seis navíos de línea par dessus le marché. Creyose entonces que los tales navíos iban allá para traerse embarcado el susodicho reyno; pero no sucedió así, porque desde entonces no hemos vuelto a ver ni reyno, ni navíos, ni Luisiana, ni Cristo que la fundó."